When she was 3 years old, Jenna Metcalf’s mom Alice disappeared after an accident at the Elephant Sanctuary she ran. Ten years later, Jenna has grown up unable to accept Alice would abandon her. She looks for her online and reads and re-reads her mother’s journals hoping to find a clue as to what happened, before finally enlisting the help of a disgraced psychic, Serenity Jones, and the Detective who initially investigated the case, Virgil (now a jaded, drunken, private detective). Despite their initial reservations, Jenna won’t take no for an answer, and the three begin to start trying to find out just what happened to Alice. What they find out is a great twist at the end of this story, and one I didn’t see coming. In fact, there are several twists which build on each other and they are one of the reasons I really liked this book. Another was that the book really wasn’t what I expected, which in this case was a nice surprise (not getting what I expect from a book doesn’t usually doesn’t work out as well for me). I had expected to enjoy it because I like Jodi Picoult’s other books – after coming to her novels late, for a while I read nothing else as I tried to catch up. But this isn’t like her other books, which tend to look at a real life situation or moral dilemma and examine it from more than one angle without leaving you with an answer. Here there is one, a definite ending. The looking at an event from more than one perspective is still there though and, by telling the story through four different people (Alice’s journals let us hear her story), Jodi Picoult drew me in. Each character is really well developed and, in some way, I sympathised with each. They were all damaged and I wanted them to heal. And, although Jenna was the main character, for me Serenity and Virgil were just as interesting and important. I was especially interested in Serenity because I had read a short story, Where There’s Smoke which introduced her character, over the summer. It was one of the reasons I was keen to read this book – I wanted to know what happened next for her. Alice's story is also just as important as her journals tell us not just what is happening in her life but also in the lives of the elephants she works with. Alice is a specialist in elephant behaviour, specifically grief, and this is a theme that runs through the book. Each character has lost someone or something and are alone in their pain. By helping Jenna, they help each other overcome their grief. Another theme is love – what a mother will do because she loves her daughter, and what a daughter will do when that love is taken away. Jodi Picoult takes time introducing and developing each character and, because of this, the book starts slowly. I didn’t find it boring though and, as the story of each person unfolds, the pace quickens, tuning the book into a real page turner. And a recommended read. 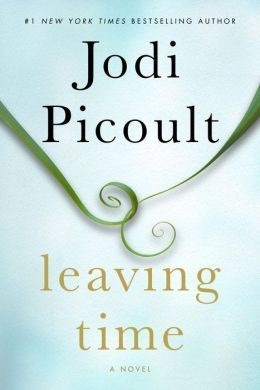 I haven’t read jodi Picoult in years…this could be the one to bring me back! Thank you. It came out in the US last week and in the UK in the next week or so I think. Hope you enjoy. Thanks for this. Am keen to read it!